Stress is a factor in everyones life. Stress comes in many forms from relationships to jobs, to money, and health to name a few. The world we live in is constantly throwing new stressors into our lives with each new activity we participate in and all actions. Finding a way to relieve the stress in our lives can be very difficult task to do a times. Meditation and walks in nature are some ways that stress can be reduced. The Stress Relief incense blend is designed to help everyone in any lifestyle relax and calm down. Everyone has stress and everyone has anxiety. 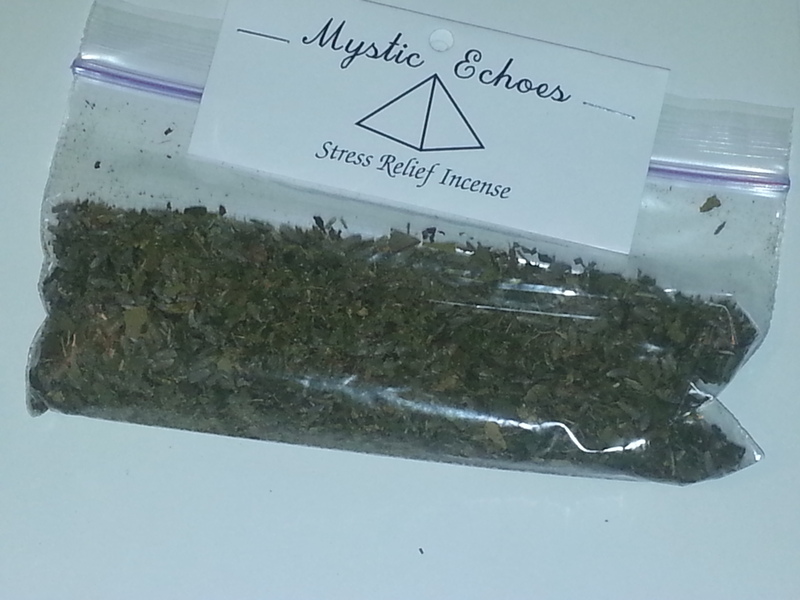 This incense blend is designed to help a person destress and relax so that they can engage in a healthy life. This incense is a blend of Lavender, Peppermint, and Ginkgo leaf. These herbss all have associations with peace, relaxation, and health which are essential properties in relaxing and becoming unstressed. Ginkgo leaf is an herb that is good for the body. This herb is mostly used with its association to circulation. Using this herb in the incense means that the energy from inhaling the smoke will be circulated through out the body more evenly and effectively than without. This allows the healing energy of the rite to really flow through the body creating maximum distribution of the healing forces. When combined with the peppermint and the lavender this herbs circulation allows the relaxing and peaceful effects of those herbs to flow through the body and smoke. Lavender is an herb that has many different purposes. This beautiful flower is a popular herb because of its scent and its versatility. One of the most common uses is to aid in a peaceful nights sleep. The concept of being at peace is essential to being able to fully relax and unwind. Lavender is well known to relax the mind as well as the body through its scent and oil applications. This makes it a powerful aid in developing stress reduction techniques and in being an aid in relaxation meditation. Peppermint is an herb that many people make into a tea to relax at bed times. This herb has a soothing scent that makes it helpful in relaxation. This herb also aids in mental clarity by slowing down the speed of ones thought’s and enables them to focus on one thing at a time. In relaxation it allows a person to change from thinking about everything in the world and focus just on being at home and enjoying the evening. Burn this incense after a difficult day at work to unwind and become unstressed.